Sepsis refers to the presence of a serious infection that has disseminated in the body through the bloodstream. It is sometimes referred to as septicemia and as “blood poisoning” by lay persons. Sepsis involves widespread organ dysfunction and can cause many different symptoms and signs. Most commonly, sepsis is due to a widespread bacterial infection in the bloodstream. The main symptoms of sepsis are a drop in blood pressure (low blood pressure), fast respiratory rate, and change sin mental status like sleepiness, confusion, or delirium. Other symptoms and signs can also be associated with sepsis. Associated symptoms can include fever or a low body temperature, chills, fast heart rate, fatigue, dizziness, flushing, and shortness of breath. Sepsis can also cause a drop in urine production, shock, and organ failure. If a person has sepsis, they often will have fever. Sometimes, though, the body temperature may be normal or even low. The individual may also have chills and severe shaking. The heart may be beating very fast, and breathing may be rapid. Low blood pressure is often observed in septic patients. Confusion, disorientation, and agitation may be seen as well as dizziness. Some patients who have sepsis develop a rash on their skin. The rash may be a reddish discoloration or small dark red dots seen throughout the body. Those with sepsis may also develop pain in the joints of the wrists, elbows, back, hips, knees, and ankles. 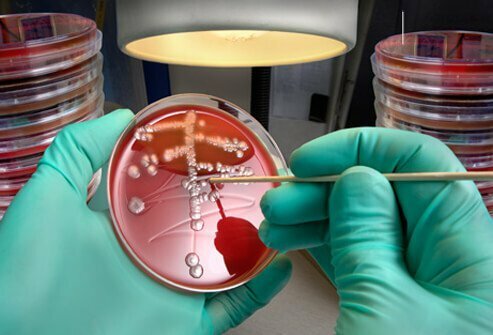 Many different microbes can cause sepsis. Although bacteria are most commonly the cause, viruses and fungi can also cause sepsis. Infections in the lungs (pneumonia), bladder and kidneys (urinary tract infections), skin (cellulitis), abdomen (such as appendicitis), and other areas (such as meningitis) can spread and lead to sepsis. Infections that develop after surgery can also lead to sepsis. Bacteria are microscopic, single-cell organisms that live almost everywhere. Bacteria live in every climate and location on earth. Some are airborne while others live in water or soil. Bacteria live on and inside plants, animals, and people. The word "bacteria" has a negative connotation, but bacteria actually perform many vital functions for organisms and in the environment. For example, plants need bacteria in the soil in order to grow. The vast majority of bacteria are harmless to people and some strains are even beneficial. In the human gastrointestinal tract, good bacteria aid in digestion and produce vitamins. They also help with immunity, making the body less hospitable to bad bacteria and other harmful pathogens. When considering all the strains of bacteria that exist, relatively few are capable of making people sick.